The Jagdpanzer IV, Sd.Kfz. 162, was a German tank destroyer based on the Panzer IV chassis and built in three main variants. As one of the casemate-style turretless Jagdpanzer (tank destroyer, literally "hunting tank") designs, it was developed against the wishes of Heinz Guderian, the inspector general of the Panzertruppen, as a replacement for the Sturmgeschütz III (StuG III). Guderian objected to the needless, in his eyes, diversion of resources from Panzer IV tank production, as the Sturmgeschütz III was still more than adequate for its role. The Jagdpanzer IV used a modified Panzer IV Ausf. H chassis, but the almost-vertical front hull plate was replaced by sloped armor plates. Internally, the layout was changed to accommodate the new superstructure, moving the fuel tanks and ammunition racks. Since the Jagdpanzer lacked a turret, the auxiliary engine that powered the Panzer IV's turret traverse mechanism could be eliminated. The new superstructure had 80 mm thick sloped armor, which provides a much greater armor protection than a vertical armor of 100 mm. To make the manufacturing process as simple as possible, the superstructure was made out of large, interlocking plates that were welded together. The first gun to be fitted was the 75mm L48 Pak 39 with muzzle brake, later replaced by the more powerful 75mm L70 KwK 42, both weapons entering the vehicle via a “Pig’s Head” mantlet, to the right of which a conical hatch concealed a machine gun. An interim model with a higher superstructure also mounted the 75mm L70, which had a muzzle velocity of 3,400ft/sec. The Jagdpanzer IV had a crew of four, weighed 24 tons and had a speed of 24mph. Side skirts were often worn, and a coat of zimmerit was applied, but this was discontinued about September 1944. Later vehicles had three return rollers rather than the original four and adopted the twin vertical exhausts typical of the late Panzer IV series. Some late vehicles also had all-steel road wheels on the first couple of bogies on each side The vehicle began entering service toward the end of 1943, gradually replacing the Marders in the tank destroyer battalions of the Panzer divisions. Although an efficient design, only 1,531 vehicles of this type had been constructed by the end of the war. Upon opening the box, you’re presented with three sprues of parts with separate parts for the upper and lower hull. All parts are molded in medium tan and show nice detail. There is very little flash, although there are sink holes in some of the smaller parts, which will need to be filled in and sanded for a smooth finish. Ejector pin marks are only present on the insides of the side skirts. 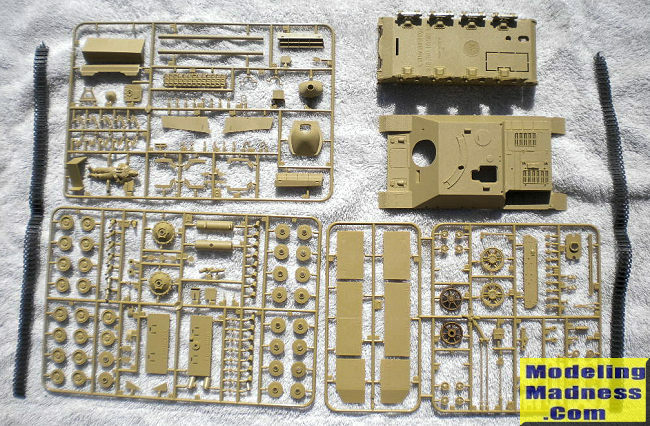 The kit does not represent the IV/70 version built very late in the war as the parts represent the version with all-rubber rimmed road wheels, four return rollers per side and the earlier horizontal cylindrical single exhaust of the Panzer IV series. I couldn’t find a copyright year indicated in the instructions or on any of the parts. The slightly rough cast texture on the hull and side skirts is restrained and well represented. The 75mm L70 KwK 42 is in two halves and is textured, so care will need to be taken in filling in and sanding the seam. The lower hull part still has placement guides for batteries and holes from when the kit was motorized, so the holes should be filled in with a plastic card to keep light shining up into the empty interior. 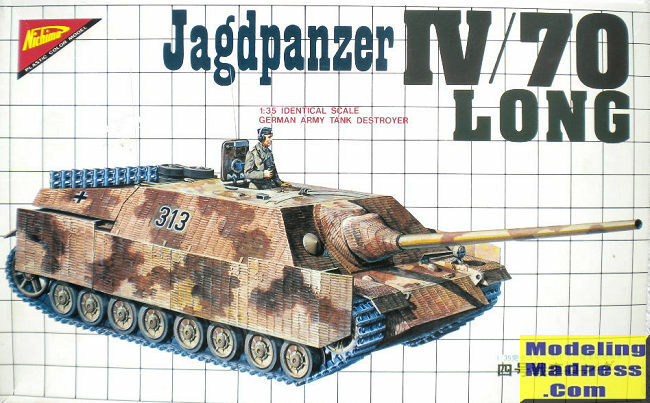 No tow cables or end connectors are included, although the pictures I’ve seen don’t show too many Jagdpanzers carrying them. The detail on some of the tools is mediocre, so some modelers may want to go the aftermarket route for these. The tracks are vinyl and are devoid of detail on the inside. A full-length commander figure is included with the detail equivalent to those from the Monogram armor kits of the 1970s. The interior hatch detail for the commander’s station is nicely done. No clear parts are included. The instructions, all in Japanese, are of the fold-out type and are well illustrated with exploded views showing a 5-step construction sequence with 13 sub-steps. There is a separate step for the motor installation with 9 sub-steps. Three pictures are shown of a completed model from various angles. The painting guide shows two vehicles, although I’m note sure of the colors (or units) since everything is in Japanese. One shows a randomly sprayed wavy pattern, while the other shows an ambush scheme. I would think that the colors call for a sand yellow base with the patterns consisting of red brown and dark green. My kit didn’t include the decals, although the painting guide shows the numbers “321” along with the insignia for the 12th SS Panzer Division. Although obviously not up to the standards of modern kits, the Nichimo kit looks to be a straightforward, uncomplicated build that shouldn’t take too long to complete. Recommended! Osprey-Vanguard 12: Sturmartillerie and Panzerjager by Bryan Perrett, Osprey Publishing Ltd (1979).